I have long enjoyed Gene Logsdon’s writing – the humor, the self-effacement, the simple Midwestern (if Ohio is Midwestern) lack of pretension, the prac-tical tips and ideas. Gene’s core message is pretty much the same in every book he writes – you can live a happy life on a few acres of land. Don’t get all preoccupied by the money, it may not pan out that you can support a family that way. But you surely can raise a good one, tending to a few chores and reaping the healthy food that will result. Gene calls his idea of this heavenly life the “Garden Farm” and quotes Robert Rodale, longtime editor-in-chief of Organic Farming and Gardening Maga-zine, that ‘In the future, most farms will be just very big gardens.’ He contrasts this message with that of Earl Butz, Nixon’s Secretary of Agriculture. Butz advised farmers to ‘get big or get out’. Logsdon, however, says: ‘get small and stay in’. This book is Gene’s last, finished just before his death. 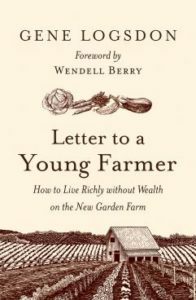 The 25 chapters display his thinking on a number of topics: barns, sheep, women in agriculture, data and robots in farming, grass farming, culturing wild fruit, artisanal food, progress, economics, going somewhere versus staying home – you get the idea. I think it might be best read one chapter at a time, perhaps on a lunch break or some other ‘quiet time,’ to let his thoughts spur you to examine a little piece of your life and see if he might have, after 80 years of thinking about it, some bit of wisdom you can use. He naively says he has searched the scientific literature for comparisons between the fertility of virgin and farmed soils and finds that most studies agree that virgin ones have larger and more diverse populations of microflora and microfauna. But he adds that no soil scientists seem willing to conclude that farming depletes soils or “that virgin soils are superior for growing food crops than soils farmed for a long time with chemicals”. Gene then tips the reader off that he is not just a casual garden observer but actually has studied these matters a little. He take us on a tour of some of the heights of 100 years of thinkers writing on soil, quoting from Edward Faulkner’s Plowman’s Folly that we have ‘farmed out’ our rich soils, William Albrecht’s soil depletion studies, Aldo Leopold’s complaint about our inability to see what is right before our faces when it comes to soil vitality, and A. Richard Crabbe on the astounding fertility of Midwestern soils in the early 1800s. He doesn’t neglect Frederick Jackson Turner and his 1893 thesis on the significance of the fron-tier in American history or Prince Kropotkin in 1907 looking at 1880 studies on comparative grain production in late 1800 England and Russia. One comes away a little bemused that soil scientists have not yet gotten around to confirm a truth which has been obvious to clear-eyed thinkers for over a century. Of course, for my money it is hard to find a better example in favor of carbon sequestration via reduced tillage than what Gene is talking about, tillage being the primary distinction characterizing farmed as opposed to virgin soil. But Logsdon only lightly touches on this explanation, seemingly preferring to leave the matter a bit of a mystery than to drive home the lesson. Perhaps that is why he reads so easily – he is never didactic and lets the reader come around on his own schedule.